The appliance of the week is the LG WM3150HWC 4.3 cubic foot front-load washing machine. 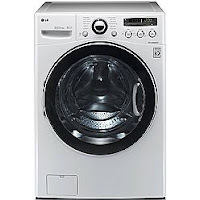 The most noticeable external change this washer got versus last year's models is the door. It borrows from the earlier round door design (shape) and the square door design (bezel under the door's smoky window). The combination of these elements, along with a recessed handle, gives the door a sophisticated and modern look without straying from the traditional circular door that has become familiar throughout the industry. The controls are based on LG's popular "3 big button" format, with a small bank of single-function and dual-function buttons just below the digital display. This format gives priority to the core functions (temperature, spin speed, soil level) and sets the secondary options in a less prominent location that is still easy to identify. LG's 6Motion system gives the 3150 all the tools it needs to wash all of your laundry properly to get the cleanest clean possible. All rinses are cold (there is little to no benefit to a warm rinse). The True Balance Anti-Vibration System ensures quiet operation, so it can be installed on any floor and even near bedrooms and living rooms. Some of the specialty cycles on the LG 3150 include Small Load, which is self-explanatory; Sanitary, which uses the internal water heater to sanitize laundry (especially good for towels! ); Speed Wash, which will wash a small load in just 15 minutes; and Hand Wash / Wool, so you can wash not only delicates, but even wool garments. This washer also offers a pre-wash, for laundry that is especially dirty and could benefit from an additional wash cycle. Water temperatures range from Tap Cold (no hot water used at all - don't use when temperatures drop below 40 degrees Fahrenheit) to Extra Hot (uses the internal water heater). Spin speeds top out at an extremely fast 1300 RPM, and this washer does offer "No Spin" as an option for those garments that really don't appreciate a zippy ride at the end of the cycle. For the eco-friendly, this washer has "ColdWash Technology," so it can use cold water to get the same cleaning results as washing with warm water. This reduces energy use without reducing cleaning power. To keep your laundry from getting sour after the cycle has completed, you can choose the "Fresh Care" option, which will tumble the clothes occasionally until you retrieve them and put them in the dryer. While there will hopefully not be any issues with the washer, LG has included its Smart Diagnosis system on board the 3150 washing machine. If your washer is misbehaving, just call 800.4.MY.HOME, and they'll have you hold down a certain combination of buttons and hold the phone near the "Smart Diagnosis" logo. The machine will beep, and those beeps will be translated into a diagnosis at the call center. They can order any necessary parts without sending a technician to your home to diagnose. You'll only need one visit to get everything taken care of. How great is that? LG's new 3150 front-load washer is a powerful new addition to the middle of LG's strong laundry line-up. If you want the capacity to handle a king comforter but perhaps aren't comfortable at the top of the line, the LG 3150 is a worthy contender for your laundry room. Give it a look! If you want increased stain fighting power, consider the LG WMG3550HWC, which is the same model with a steam generator. It's only a $100 difference (regular price).